nama5 ThumbsUp! is simple plug-in for Microsoft Windows® which allows you to preview your RAW photos when browsing in Explorer. 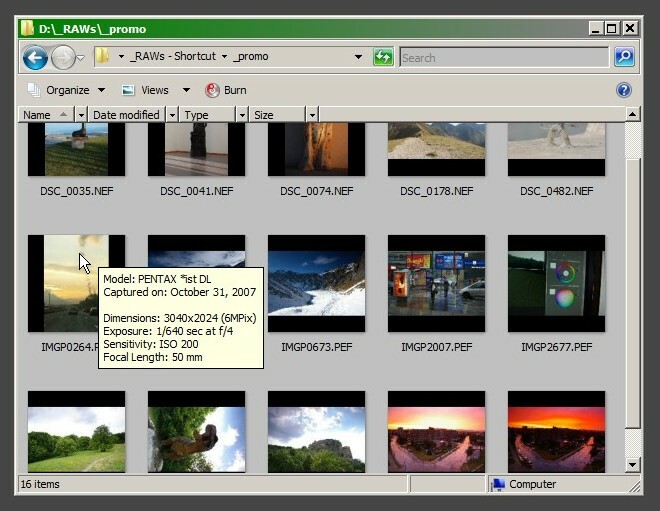 It extracts low-resolution embedded image from RAW file and display it in “Thumbnail” view of Explorer what simplifies searching in your photos. Thumbnail view in a directory with RAW images. nama5 ThumbsUp! is based on 32-bit platform and thus it is available just for Windows XP® and Vista®. Under 64-bit versions of XP and Vista you can use our plug-in with 32-bit version of Explorer which is still available in these operating systems (shortcut to access the 32-bit Explorer is automatically made on your desktop in this case). We would like to fully upgrade to 64-bit platform with nama5 ThumbsUp! version 1.0.